My first properly done up piece in 2013! It's actually rushed within 1 and a half week while juggling other homework. 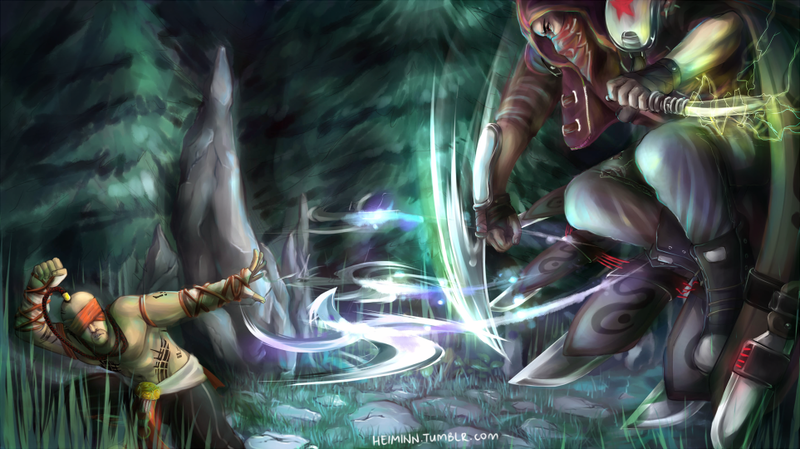 It's Lee Sin the Blind Monk and Talon the Blade Shadow from the game League of Legends. An item from the new season had to be drawn as well and my bro told me to just go with the Statikk Shiv. I can't say I am familiar with the character, nor League of Legends (Albeit the name sounds familiar). That said, this is absolutely fantastic, you have talent! Very well done, certainly worth a favorite. My brother is obsessed with LOL! Do not tell me YOU TOO! ...BUT I SHOULD GET INTO IT SINCE EVERYONE IS GETTING INTO IT. This is one of the few complete action scenes I have seen! YOU MUST BE SERIOUS ABOUT THIS GAME.